Mark’s Tuckpointing has been repairing, restoring and replacing masonry for over 30 years in North Shore, Illinois. If your home or business needs masonry repair, call our highly trained and experienced experts today. We offer honest prices, reliable service and are always on time. You can depend on our team for your next masonry project! Getting masonry repairs done when needed will help prevent serious problems from happening in the future. Repairs should be done right away if you notice the brick or stone has: cracks in concrete, deteriorating mortar joints, sinking masonry or the brick or stones become loose or start falling out. If you have water damage on your brick or stone masonry, it should also be repaired right away. Water damage can cause masonry holes, cracks or start to deteriorate. One way to tell if your masonry has water damage is to check for any discoloration or dark patches on the bricks or stones. The professionals at Mark’s Tuckpointing are highly trained and have years of experience in masonry repairs in North Shore, Illinois. The next time you need masonry repair service, call Mark’s Tuckpointing! Missing Mortar – about every 15-20 years your brickwork needs to be repointed. If you have lots of storms then you may need it done sooner. Make sure you hire a professional to repoint your brickwork to avoid problems from occurring in the future. Interior Problems – cracked and deformed windows could indicate that your masonry needs repair. Cracked Masonry – cracked masonry needs to be attended to right away. If not taken care of it can cause cracks in your North Shore home, which will allow water to get in and create water damage. Tuckpointing can last over 30 years if done properly. However, if you’ve had severe weather conditions then you might have to get your masonry replaced. When a professional comes to your home to determine if you need a full replacement there are a few things they will look for. They will look at your mortar to check the color, grade of sand, and see if its crushing pressure on your North Shore home. If the issues are small then they can usually be repaired. If your bricks or stones are severely damaged then they will need to be replaced. During a full masonry replacement, our professionals will do our best to match the current bricks or concrete currently on your home. Only an experienced contractor should do your masonry replacement. A professional has the skills needed for a full replacement and to ensure it will last for many years to come. We have highly trained professionals at Mark’s Tuckpointing. We have worked on residential and commercial buildings and have experience in just about any problem you can think of. No project is too big or to small for our team. We serve the Chicagoland area and the surrounding suburbs. If you have any questions or concerns about your masonry, call us for a FREE estimate. 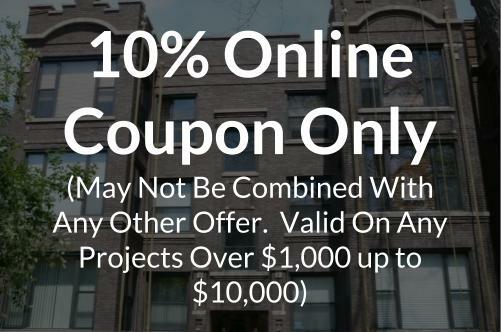 We can give your home or business in Chicago an online estimate and answer any questions or concerns you might have. We even provide a follow-up service, if necessary.